The steps below will explain how to add a customer with an existing account and adding a customer without an account already created. Click on the "Manager" icon on the upper right hand side. Next, click "Add New Customer." Enter their "Email or Serial Number" to link their account to your account. Then click "Next." If the customer already setup an account, you will be prompted to Click "Request Access." This will send the customer an email asking for access to manage their controller. If your customer does not have an account, enter the "Email Address" requested by the customer. You’ll then be able to create an account immediately. Send Notifications To Choose where to send emails about controllers being offline or plans requiring renewal. This can be either your email address or your customer’s email address. Send activation email to me instead of customer’s email address If you don’t want the customer to receive an account activation email, check this box and the activation email will not be sent to homeowner. Once you click Create, you’ll be taken through a wizard to set up your customer’s controller. The controller will be linked to your account. 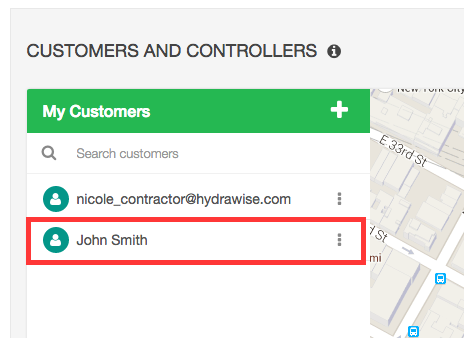 Your new customer will then be visible in your list of customers in the Contractor Portal (Fig. 1). The homeowner will receive a email notification automatically from Hydrawise to set up a password (Fig. 2-3).